Crane Credit Union is FTK! 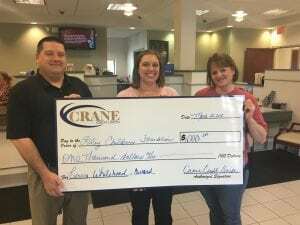 Crane Credit Union, an Indiana credit union headquartered in Odon, IN, participated in Miracle Jeans Day at the end of 2017 and helped raised money for families cared for at Riley Hospital for Children. Crane supported the Riley Children’s Foundation by offering employees the opportunity to wear jeans each Wednesday. Employees paid $5.00 each to wear jeans. The Credit Union also gave all employees a red Crane Credit Union shirt to wear. The staff used canisters, banners, and stickers to promote the effort and encourage Credit Union members to donate, as well. Their donation will help to fund the greatest needs within the hospital, including Child Life Specialists who help make the hospital experience less scary for patients and their families. In addition to Miracle Jeans Day, Riley mom and Crane employee, Mindy Lindy, chose to donate the $1,000 she won through the Lenora Whitehead Award to Riley. The Lenora Whitehead Award is named in memory of a former Crane employee who went above and beyond in her job and is awarded to current Crane employees who embody the same type of work ethic. Mindy’s daughter has benefited from the craniofacial and neurology teams at Riley. Crane Credit Union began operating in 1955 serving members from one branch location on NSA (Naval Support Activity) Crane Base. The Credit Union now serves over 46,000 members in central and southern Indiana with 14 branch locations. 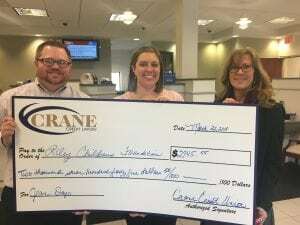 Riley Children’s Foundation is so grateful for the amazing generosity of Crane employees and members!